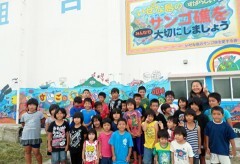 On June 14, in Serikyaku, Izena, Yoko Higa (extreme right in the back row) and other children took part in the painting. The Coral Preservation Association is trying to preserve coral by informing residents in Serikyaku on Izena Island about its importance. On June 14, the association worked with children to complete a large mural on the back of the head office of the Izena Fisheries Cooperative. Mainly centered on about 120 cooperative members, the association has been working to preserve coral since three years ago. The association has called the mural “Coral is a treasure of the sea.” One of its members, Yoko Higa, who teaches painting in Izena Elementary School, worked with the children from the Serikyaku Children Association and the school’s painting class. The children learned about the importance of coral from the project. They painted sea creatures such as fish, crabs and sea slugs in with the coral.